CLICK ON ANY IMAGE IN A GROUP TO ACCESS ITS GALLERY, MEMBERS OF WHICH CAN BE VIEWED FULL SIZE BY SCROLLING DOWN AND CHECKING BOX ON BOTTOM RIGHT. SINGLE IMAGES CAN BE ENLARGED WITH A CLICK WHICH CAN BE REPEATED IF REQUIRED. Today’s sky was cloudless, the sun shone, and the temperature was hot enough for summer. Most of our tulips are now fully opened. The mirrors, like these beside camellias, now have blooms to reflect. Heucheras and forget-me-nots are enlivening the rose garden edges. Butterflies, including commas, freely flit about. 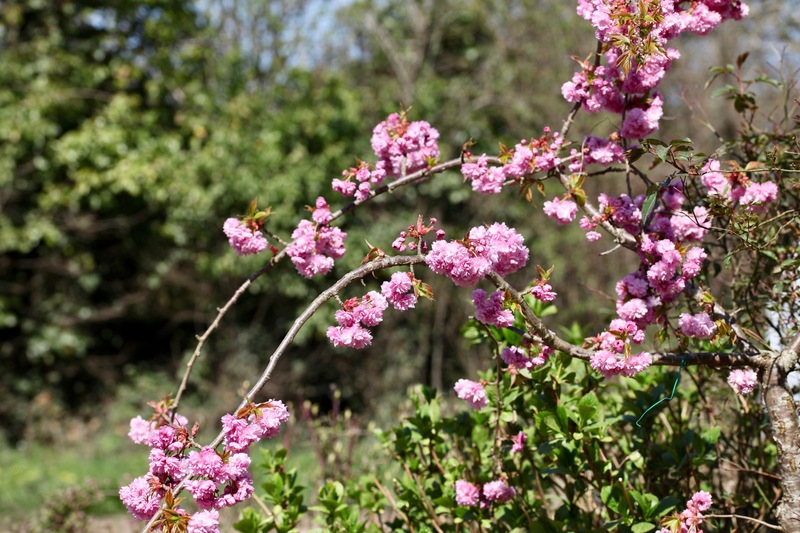 Now that the winter flowering cherry is thinking about shedding its blossom, others are coming into full bloom. Naturally, we took a drive into the forest. For most of the stretch of road between Burley and Bransgore we were treated to a generous display of shiny MAMIL backsides. It was difficult to construe the occasional cyclist’s veering across the centre of the road other than as designed to prevent any thoughts of overtaking the crocodile. By contrast, the equestrian on the horribly pock-marked Snails Lane had the good sense to tuck in her steed and wait as we approached. Perched on the backs of long-suffering donkeys at Ibsley, a clattering of jackdaws filled their beaks with the creatures’ soft, flexible, hairs pecked out for use in nest building. As I approached the scene, the birds flew off. Uncomplaining, silent, and motionless, this forlorn creature fixed me with a baleful eye. but at Hyde they were reluctant even to share it with motor vehicles. We lunched at The Hyde Out Café then collected a blood test referral form from our GP. This is for a post-hip-replacement follow up. There are no problems but I have been asked for this and the completion of a questionnaire because, in the years since my operation, involving a metal on metal replacement, it has emerged that that method has led to later difficulties for some people. My knees are nothing to do with that. Paul popped in for a visit this afternoon, and we enjoyed our customary pleasant conversation. Modern life and its geography means that this is something that doesn’t happen very often now, and it is our loss. This entry was posted in Uncategorized and tagged camellias, comma butterfly, cow, cyclists, donkeys, heucheras, horse and rider, jackdaws, MAMILs, tulips by derrickjknight. Bookmark the permalink. Oh, how I feel for that donkey. You’ve captured its pathos perfectly. Those donkeys certainly do look forlorn! True. Dropping by was the way we caught up with each other and it was lovely and uncomplicated…spontaneous. Now appointments are necessary…busy , busy, busy. May I use one of your photos of donkey and jackdaws to accompany a poem? Commas are really beautiful butterflies, especially that ragged rear edge. Agree with John’s comment above. They’re hard to confuse with anything else British, at least until the autumn when other varieties begin to look the worse for wear. Glad you had a sunny day finally. It’s about time! You flowers are dancing with joy! It looks like spring has truly sprung there! It is bright and sunny here today, but still colder than usual. That poor donkey! He certainly looks forlorn. I can’t believe the jackdaws just pulled hair right from him. I wonder if maybe they eat bugs, as well? Maybe it’s just me trying to look on the good side, but I’d prefer to think that the birds are helping out. We do think they eat bugs, because we have seen them similarly perched without furry beaks at other times of the year. Mother Nature always seems to have figured it all out way before we do. Poor little fella…he looks so sleepy. Your tulips really pop, Derrrick! Glad to hear you’re enjoying some warmer temperatures. You have so much traffic derrick! The ponies cyclists and other wildlife make your gorgeous area so lively! Thank you for the review Derrick (but maybe not me though). I looked up “heucheras” and, as I thought, they are what I call coral bells. I love them so much, and so do the hummingbirds. Your garden is coming into itself. Looking forward to this year’s show. I know them as coral bells too, but some of the amazing varieties we get now seem to require there own individual names! Oh, you are so right, Jackie – I had no idea there were so many beautiful versions of them. I have just one. I’m fairly sure the animals have better road manners than the bicyclists. The poor donkey. It looked pretty unhappy. Your garden, however, looks its usual well-cared for self and the butterfly was no doubt enjoying it. As for your hip, goodness, there are complications in modern medicine. I hope all remains well. I think the hip is OK, Lisa. The surgeon also told me that the knees were nothing to do with that. Thanks very much. Hip, hip, hooray for your comments, Uma. Thanks a lot. What a lovely day. The garden looks especially good, amazing what a day of sunshine can achieve however belated! What a lovely drive you had…and yes, the flowers are lovely! Oh, that donkey! Poor creature. I don’t suppose there is anything the donkey can do to stop the birds from plucking. Lovely, lovely flowers. So cheering as the landscape in central Maine is utterly dismal. I think Spring has forgotten us. Is it something we said, I wonder? Very many thanks, Laurie. I hope Maine cheers up soon. Another donkey was successful in shaking off the jackdaws. “Jackie’s splendid chicken jalfrezi and aromatic pilau rice”: so THAT’s what I could smell when I arrived (note to self: must arrive later next time I call in at short notice… ) We discussed the jackdaw/donkey ‘symbiosis’ (if that’s what it is): other posters’ comments have led me to wonder if the birds indeed have picked on a weak or ill animal that doesn’t have the strength to shake them off. The ability of more predatory species than these to pick off the sickly and weakened from a herd or flock is widespread across Nature, so it may not be as “you-scratch-my-back-&-I’ll-scratch-yours” as it looks. Just catching up again, Derrick and Jackie. The gardens look like they are coming along nicely. The poor donkey! I’ve never seen birds plucking them directly for nest material before.